The runoff from the snowmelt and rain will lead to rises on rivers, streams, and creeks and with these swelling water bodies. * Portions of all of central Iowa from the Minnesota to Missouri borders. * Rapid snowmelt and expected rainfall is expected lead to significant rises on rivers and streams and the potential for ice jams. * Favored ice jam locations include the Des Moines River around Fort Dodge, the Raccoon River around Van Meter through Des Moines to the confluence of the Des Moines River, the Iowa River around Marshalltown, and the upper reaches of Cedar River north of Waterloo. Other locations are possible for ice jam flooding. Minor to moderate river flooding from snowmelt and rainfall is possible in some locations. 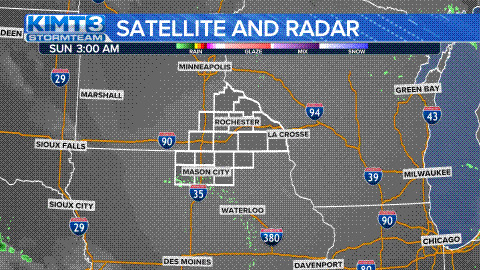 * All of northeast Iowa, southeast Minnesota, and much of western, central, and southwestern Wisconsin. * From Wednesday morning through Thursday evening. * Warmer temperatures into midweek will create rapid snow melt, with periods of rain also expected. Run-off from melting snow and rainfall will bring rising water levels for many rivers and streams, with an increased risk of flooding. Additionally, break up of ice on rivers may lead to ice jam formation, which could heighten the risk for flooding in localized areas.